Even though most college visits will kick off with an information session, not all of your questions will be answered in the presentation. Quick, basic facts about the school—like average SAT and ACT scores, acceptance rates, and required GPA—may be skipped over in favor of exciting extracurricular activities and honors programs. Luckily, the tedious-but-necessary stats are usually easy to find online, and a quick search can usually tell you if the college you’re visiting is a reach or safety school. Before you step onto any beautiful, ivy-covered campuses, have a list of things you’re looking for in a school. 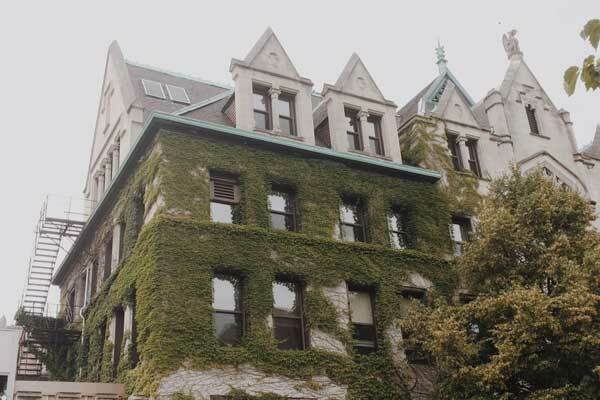 If you don’t want to go to a college with a rigid core curriculum, you probably don’t need to visit the school that tells you one-third of their classes are core—even if the campus does look like the set of Dead Poets’ Society. And when you do end up touring potential campuses, remember that it’s easy to fall in love with the 100-year-old architecture or 17 libraries, but those glossy details probably won’t be that important to you in the long run. Keep an eye out for the stuff you care about. Not all campus tour guides are created equal. Finding someone who is from your hometown, studying your desired major, and skilled at anticipating your questions is a long shot—after all, tour guides are students first. Make a list of campus visit questions you want answered before your tour, and then make sure you find out the answers. You can ask questions at virtually any time during a tour, and if you’ve just visited the dining hall and still don’t know how the meal plan works, speak up. You don’t want to have any lingering questions either—that student tour guide won’t be sitting next to you on the drive home to explain how roommates are assigned. Do you want to observe a class? Sit for an interview? Stay overnight? All of these things are possible, but you might have to search for them. On my very first college visit, to Washington University in St. Louis, I called the admissions office and was able to sit in on a class where the students discussed gender in Jane Austen’s Mansfield Park. It was a great opportunity not only to see what the classroom was like but also to meet students, and it ended up being part of the reason I fell in love with the school. Even though calling an admission counselor seems more intensive than just signing up for a tour online, it can open up valuable opportunities. They love their school and want you to love it too. It’s perfectly normal to be overwhelmed by the college search process, especially when the second go-to conversation topic is “What are you doing after high school?” But college visits aren’t a time to stress about your future. They’re for learning about your options and finding out what you love and hate about different schools—this is all about you. If you’re having trouble relaxing while you walk around campus, try to plan some activities outside of the school you’re visiting; go to a restaurant, walk around downtown, see some tourist attractions. Not only can you de-stress by taking a break from looming college decisions, immersing yourself in the city near the campus can help you feel what it would be like to live there. Meg Matthias is a high school senior and writer who is almost always at one of the three libraries she belongs to. She is the recent founder of her school newspaper, which she hopes will live up to her journalism-movie-fueled expectations. When she’s not reading or writing, you can find her making history flashcards, looking for the perfect red lipstick, or scrolling through college websites to find required SAT scores. She has published poetry online in Rookie magazine but is in lasting love with prose.